Relate: His name wasn’t Joe, but Joe works. Joe was a junior at a camp where I was counselor. He wasn’t the best looking guy, he wasn’t the smartest, or the most sociable. On all counts he was a little below average. He was a follower and about a month earlier he followed some other guys into doing some very stupid things. They were caught. Now Joe had a court date coming up. He also had scars on his wrists. In his words, Joe said, “I’m such a screwup I couldn’t even do that right.” I sat in the back of the chapel with Joe and we read the end of the book of John together. We started with chapter 18 and just kept going. After every moment of suffering Jesus went through on the way to the cross I stopped and said, “He did this for you.” We were both in tears and before we got to the end, Joe had given his heart to God. That was well over a decade ago. Joe is now serving the Lord, he has a great wife and some awesome children. The advent of facebook has helped us reconnect and Joe has shared how his scars are now a story. He has a gift for investing into the lives of people who are now where he was. What he once saw as failures he now sees as opportunity. React: Levi was a failure. He was cursed. He had taken the distinctiveness of God’s covenant and, with his brother Simeon they used it to murder an entire community for revenge. Years go by. Lots of them. Now his descendants have taken this curse and used it as an opportunity to focus on God. The Levites are cursed to never have their own inheritance, instead God is their inheritance. The tragedy of an ancestor’s failure is now a springboard with which they can lead all Israel in worshiping God. What stories do my scars tell? My hands are riddled with them. There’s one by my thumb where my sister clawed me because I stole… something of hers. There’s where I got stitches on my middle finger when I almost cut my finger off with the hedge clippers. I’d convinced my dad I did half the ride to the emergency room. He wasn’t too happy with that. My eyebrow covers up more stitches from riding a rocking horse right down the stairs. I thought I’d killed it. But there are also deeper scars. From the girl who showed a love poem I wrote her to the entire school. Some of the names I was called. And there’s deeper scars still that don’t need to be shared. You have some of those too, I’m sure. We all do. We’ve all sinned. We’ve all failed. We’ve all been the victims of others sin and failure as well. The question is, will I be like the Levites? Will I allow my scars become the stories of God’s grace or will I wallow in the failures of the past and drift into obscurity, like Simeon who shared Levi’s curse. Which will I chose? What about you? Help me never to forget, God, that You have scars. You carry the marks of my shame. My sin is what nailed You to the tree and dragged You to the grave so that it doesn’t have to drag me under. You will carry those scars through eternity so that I will never forget Your amazing grace. When I let myself be dragged down by the shame and guilt of my past I belittle what You have done for me. Help me to never to do that. Instead let me take the story of scars, Yours and mine, to those whose hurts are still needing healing. Very touching post. And that is one of my favorite songs!! I love this…God bless you. When I was a young teen, I wrote to J. Vernon McGee about the scars from my father’s leaving us to marry another. Dr. McGee wrote back and said God could heal those wounds, and that I didn’t have to let them define me or keep me from serving the Lord. Thank you for reminding me of that. What a great, and moving, post! Have a great week! A very wise woman once told me… “Let your Mess become your Message”. We each have a story, and that story can reach out to anther with love, compassion and understanding, and in the process point to Jesus as the one who heals. Great post. I wrote a post titled “my scar, His Scars” on my blog. 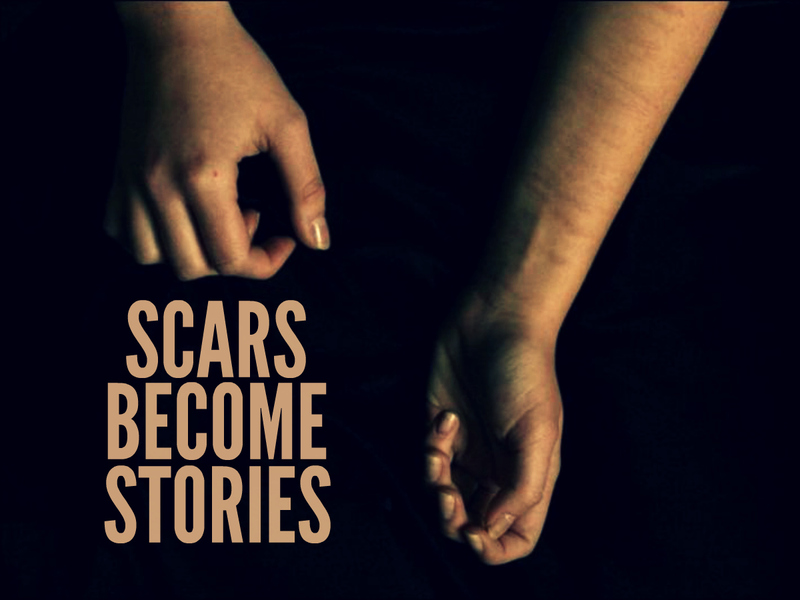 We all have stories to share relating to the various scars in life. I find it amazing that the Lord can be glorified when we open our wounds to each other. This is a reoccurring message to me lately, about the scars, pain of the past, being used by God for others . ..turned into something beautiful. Thank you and God bless you! Reblogged this on Life, Literature and the Law. AWESOME! I love this. Blessings! This is so true when I recounted my failures to God recently He said he looks only at the successes hence me getting back to my writing again after a break…..Also when I was very ill and haemoraging with loss of a lot of blood, frightened I prayed the LORD answered I understand I too lost a lot of blood. Outstanding post you touched me deeply keep up the great work as you are no doubt a human angel sent here by GOD to help others. Thank you. In Hebrew the word for angel, “malach”, also means messenger. My goal is to simply take the words and ideas God gives me as I spend time with Him and spread it around, to be His messenger. You touched my heart this morning. Thank you! I’ve just discovered your blog because you like my post ‘That Girl’, thank you. I wouldn’t have come across this touching post otherwise. Indeed, scars become stories. I’m learning this from my own life. I read my title in the heart of what you wrote. Hi dear! I want to comment on your line that the Levis were cursed by God not allowing them to have their own inheritance. I don’t think the Bible captured it as a curse. Though they’d been cursed by Jacob, being selected to bear the ministry of God was their blessing and salvation and not in any way a curse. They had the inheritance of a king, one tenth, even though their portion among Isrealites should have been 1/12. I don’t want to be critical, as I really appropriate your blog posts. I just thought to add that contribution. Cheers and God bless. Actually, reading it again, I think I missed what you were saying. The curse was not having their own inheritance, not that they had God as their inheritance, which was the blessing you mentioned. Sorry I misunderstood. Simeon and Levi were cursed by Jacob in Genesis 34. This curse was repeated when Jacob spoke prophetically over his sons in Genesis 49. Both the curse and the prophesy were fulfilled. They were dispersed among the other tribes. They had no land or inheritance of their own. That does not mean it did not also become a blessing. Who hast no wound… or scar? I love the concept of making our scars part of our stories. Thank you for sharing. Scars with memories of hurts and pain. Yet with memory of His scars comes forgiveness and second chances. Thank You Jesus for all You bore for us.